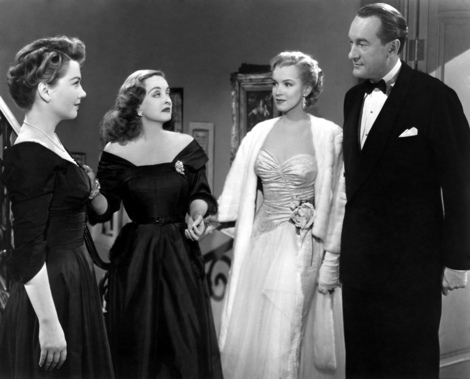 Another of my top ten favorite films, 'All About Eve' is the quintessential 'show business' film. If you are a fan of stage or screen, this timeless look into the lives of the 'players' will always prove to be a great piece of entertainment. Synopsis: Margo Channing (Bette Davis)is a renowned stage actress, revered for her great commitment to her craft. One evening, Margo is introduced to Eve- a starry eyed fan of her work who has seen every performance of her current play, 'Aged in Wood'. Eve's charming personality and infatuation with the stage make her a beloved addition to Margo's circle of friends...for a time. Acid-tongued columnist Addison DeWitt soon sees something in Eve that the others do not...determination and driving ambition. By the time the people to whom Eve has attached herself become aware of her goals, the damage has been done. The Film: One of the most successful things about this film is Mankiewicz's 'stage-like' direction. It retains the appeal of a live production while still giving us gorgeous black and white cinematography and stunning camera-work. The subtle nuances of the character development are increasingly apparent as the film progresses, inviting us into Eve's world and Margo's confusion. The dialogue is unequaled, possibly the best ever written. It is both witty and profound; candid and coy. Never once does the story lag or the execution of it disappoint. The Players: I make no secret of the fact that I feel this is the 'dream cast'. It is an absolutely perfect juxtaposition of attitudes and skills that cannot possibly be conveyed by simple delivery of the brilliant lines. Standout is of course Davis...and this is her crowning achievement, in my opinion. Her Margo is a flawed but powerful heroine, a lady you'd feel honored to know-but in whose presence you'd feel inadequate. Her troubled heart is evident throughout the film, and yet her tough exterior makes her seem even more human. Playing a very slim 'second-fiddle' to Davis' scenery chewing broad is George Sanders as Addison DeWitt- the cynical theater critic whose admiration of Margo's talent is in conflict with his obvious attraction to Eve. In the latter, he sees a feminine counterpart...someone who shares his passion and tenacity. From the opening narration, his honeyed voice inevitably pulls you into the drama at hand. Supporting parts are also immaculately played, from Celeste Holm's loyal wife and friend to Gary Merrill as Margo's masculine support team and Thelma Ritter as her shrewdly perceptive maid. Marilyn Monroe also makes a memorable big screen debut as Miss Caswell, a flighty model who is trying to break into acting- using Addison as her means to an end. Final Thoughts: There are not many dialogue driven films that can retain my interest after multiple viewings, like this one. It is by far the most successful film of its kind and is a 'must see' for anyone who is interested in theater and the lives of those who have chosen the stage as their career. Make sure to check out the 'extras' during the party and restaurant scenes for great glimpses of early 50's styling. Monroe has also never looked lovelier. Her 'audition' costume and styling is my favorite of the film. I was just reading Marilyn Monroe's "My Story" and thinking that I ought to watch "All About Eve" again after reading about her involvement in it. I agree completely with your review! I love that movie! Every time I watch it I see something new in it. I heartily agree with your! I must see this! I love the 50's it's my favourite era. By the way, I've just wrote a blog post about you! I'm quite new to the whole blogging thing but I love it! LOVE this movie. it's so creepy!